This quotation from Hershey who dedicated his life in the study and research about diamonds perfectly illustrates the value the human civilization has put to this precious gem. From the world’s vast history up to the present times, diamonds remain to be the most-sought after gem not only because of its beauty and quality but also of its cultural and historical underpinnings. There are different kinds of diamonds, with princess cut diamond being the most popular one. It is commonly used in adorning special jewelries such as necklaces and engagement rings. Princess cut engagement rings are so often the most recommended kind for couples because not only are these very precious, they also signify eternity and union. It is this role of diamonds as timeless symbolisms that rendered them a high value. But what exactly are the reasons why diamonds are highly revered and appreciated? Read on to know how diamonds has gained such prominence. Diamonds have played significant roles in the history of the world. In ancient civilizations, such as in India 3,000 years ago, was used in refracting light, thus is considered monumental in the developments in light technology. It was also used for decorative purposes because of its colors and brilliance. Aside from their rich history and cultural significance, diamonds are also regarded as the most precious gem because of their superb durability. In fact, the word “diamond” came from a greek word “adamas” which means “unbreakable.” Diamonds have been formed through natural geological process for a long time and their constant exposure to heat and pressure has made them very precious stones. This long and tedious journey alone makes diamonds precious and worth one’s high appreciation. But while diamonds as stones alone are very precious as they are, they value is taken to higher level when they are incorporated in jewelries and adornments. This process, again, is a very tedious and sophisticated one that only experts in jewelry and metallurgy perform it. Before these diamond-studded ornaments adorn your body, they first go through the care of skilled individuals who transform these raw gems into a jewelry pieces that are really of high value. i thought shoes were a girl's best friend. diamonds are a sign of commitment with someone. I really like that diamond are form by constant exposure to heat and pressure. It gives you an idea what pressure can make a person by facing it, they become diamonds too. Besides being a jewelry, diamonds are also use to cut other type of gems and glass which really shows how durable and precious the diamond is. Diamonds have long been a symbol of value, quality, and emotional sentiments. I don't think that will ever change. hat's why there is such a saying that goes "Diamonds are Forever"
The most precious stone ever! At some point, diamonds became a measuring stick of one's economic status for obvious reasons. Diamonds are forever. And Diamonds are a girls best friend. And its imply the state position that you have in the society. They say that only a diamond can cut a diamond. I think this is true. The most expensive and valued stone-"diamonds are forever"!Just remembered the movie "blood diamond" of leonardo di caprio. Diamonds are truly precious. In a relationship, it simply means that love is as precious, unbreakable and ever lasting as the diamonds. Leonardo's film Blood Diamond slips into my mind. Yes, diamonds have its own good side but as well its bad side. Just like in the above said movie, blood was shed by people just to have a piece of this stone. The older the diamonds, the higher the price tag of it. Am I right? That's why people who buy antique diamonds seems to be millionaires at this generation. Great informative trivia on diamonds. I didn't know of its word roots, and that was great to learn from here. I have a special affinity for old Greek words ('dynamis' was my first tattoo) and this is a good word to add! Diamonds are forever be elegantly beautiful and expensive. 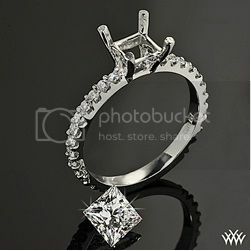 How I wish I can have one jewelry with even a small diamond in it. I love diamonds in my jewelry. I had a set of earrings and ring but sadly I only have the ring now. In case I'll have a budget, I want to buy an eternity ring. thats why its too expensive! I wish I could own one someday..
no other precious stones can compare with diamonds in its beauty, that's why it's the most coveted. but what's a diamond if the inner beauty of the wearer doesn't shine through? I love diamonds! Though they're really pricey, there's just such happiness it brings to the owner. Thank you for enlightening me with the etymology of the name of this precious stone, I find those interesting. Diamonds are forever. I am not really fond of jewelries and even diamond, but if I can have one, why not? It is pricey but could also be priceless if a lady accept this as a gift from the man she truly loves. When we long for life without difficulties, remind us that oaks grow strong in contrary winds and diamonds are made under pressure!